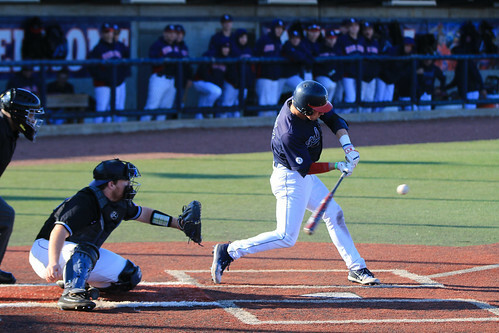 The Belmont baseball team defeated Lipscomb University 8-7 at the annual Battle of the Boulevard Tuesday night at E.S. Rose Park. Freshman Jackson Campbell secured the win for the Bruins after driving in junior Hunter Holland with a walk-off RBI double. Senior Cully Day helped the Bruins reach 13 hits, a home run and an RBI, while Holland, Matt Cogen, Austin Reynolds and Jackson Campbell also secured bases. Freshman pitcher Chandler Schultz grabbed his first win tonight against the neighboring Bisons. The team earned its fourth straight win against Lipscomb, and now holds a 29-18 all-time record in the boulevard rivalry series. The Bruins are now 7-9 overall and remain undefeated in conference play with a 3-0 record. Be sure to catch the Bruins at First Tennessee Park on March 20 as they take on the Vanderbilt Commodores at 6:30 p.m.. Photos and recap by Carina Eudy.